Saying an official farewell to summer with this outfit that kind of embodies it. I’ve never been one to shy away from white in winter, but the bold stripes and sandals kind of solidify the summer vacation vibe. I wore this to dinner at one of our favorite new restaurants down in Hot Springs, Les Cochons d’Or. We love the fancy, but not too fussy farm-to-table French cooking featuring local ingredients cooked on their wood-fired grill (the smell in this place is heavenly!). I’m already thinking wistfully about our next trip down to this area so we can go back! I am in love with that top! So cute! This is a beautiful look! I’m not ready to say farewell to summer. Say it aint so! I’m such a summer gal, but still excited for everything fall has to offer! I love this top, and the way you styled it with those sunglasses and your hair! Such a chic look. I know that feeling! 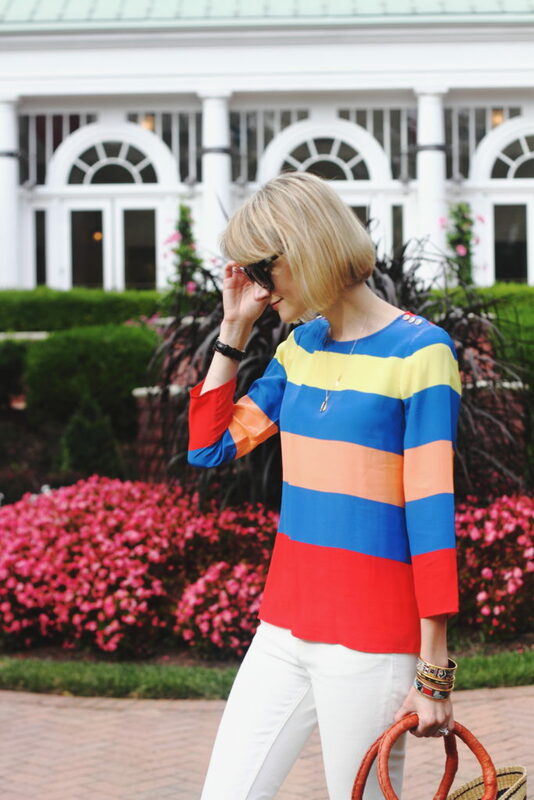 Still holding tight to my bright colors! I went to Les Cochons d’Or with Lacey and Carlis last year, the food was spectacular! Cute top! I love this look! !